Another view looking south from the Lorain Avenue bridge, this time showing the Nickel Plate Road's massive lift bridge over the Cuyahoga River in the background. The Erie's line from Literary Street Yard (barely visible through the lift bridge) and the River Bed Yard and ore docks is at the extreme right. 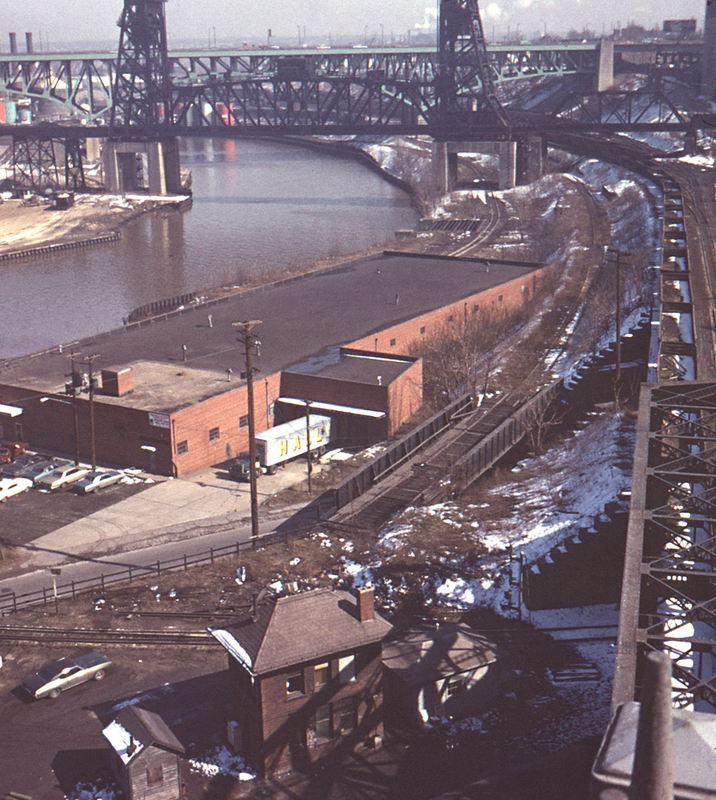 The track running from left to right at the very bottom of the photo belongs to the former Big Four and crosses the Cuyahoga River on a draw bridge to reach some remaining freight terminal trackage. The tower was DK tower and also belonged to the Big Four (New York Central), and controlled the draw bridge and the former grade crossing with the Erie's connector to the Big Four main (behind the photographer) used by the Erie's passenger trains until they moved to Cleveland Union Terminal.